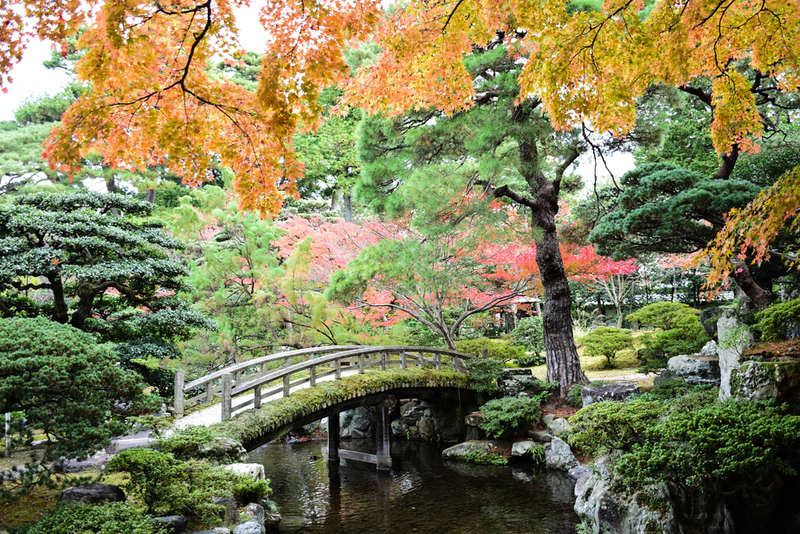 Central Kyoto contains two of the most important tourist sites in the city: the Kyoto Gosho (Imperial Palace) and Nijo Castle, as well as a few smaller sights and attractions. Central Kyoto is basically everything in the wide plain in the middle of Kyoto, with the exception of the areas we cover in the Downtown Kyoto, Kyoto Station Area, and Nishijin sections of this guide. One of Kyoto’s least visited but most historically important shrines, Kamigamo-jinja Shrine is a great place to catch your thoughts up north. Funaoka Onsen, which is actually a sento, is the best public bath in Kyoto. It’s well worth a trip across town to relax in this beautiful bath house. The Kamo-gawa riverside is really just one long park which Kyotoites use for relaxation, exercise and contemplation. Goko-yu Sento is a large public bath on the southwest side of Downtown Kyoto. It’s a “destination sento” with a wide variety of baths spread over two floors. A beautifully preserved ageya (geisha entertainment house), Sumiya is a truly sublime showcase of Japanese architecture, design and decorative traditions. Kyoto’s best hamburgers are served at Grand Burger restaurant, just a short walk east of the north end of the Kyoto Gosho Imperial Palace Park. Not far from the west side of the Kyoto Imperial Palace Park, this superb and tranquil tearoom is a great place to sample some traditional Kyoto sweets and excellent green tea. At Teahouse Motoan, you can have your cake and eat it – along with a cup of green tea. For some wonderful Japanese takes on Western pastries paired with excellent green tea, check out this gallery/café on Muramachi, a short walk northwest of downtown. For more good budget options, see the Downtown Kyoto accommodation section. If you’re looking for an efficient and reasonably priced business hotel in the middle of Kyoto, the Vessel Hotel Campana Kyoto Gojo is a great choice. Overlooking Nijo-jo Castle, the ANA Crowne Plaza Kyoto is a good mid-range hotel with a variety of onsite facilities. It’s very close to Nijojo-mae subway station. The swimming pool is a nice touch. For more good moderate options nearby, see the Downtown Kyoto accommodation section. Shiki Juraku is a “hotel” composed of 10 beautifully restored Kyoto machiya (townhouses). This truly special accommodation offers the chance to experience Kyoto living and the convenience of a hotel. For more good luxury options, see the Downtown Kyoto and Southern Higashiyama accommodation sections. See also the list of Central Kyoto hotels on Booking.com or Agoda.com. Subway line going west and get off at Nijo-jo-mae for Nijo-jo Castle. By Keihan Line: Take the Keihan Line north to the last stop, Demachiyanagi, for Shimogamo-jinja Shrine. By taxi from Kyoto Station: A taxi from Kyoto Station to the Kyoto Gosho or Nijo-jo Castle will cost about Y1200. By bicycle from Kyoto Station: Cycle up the Kamo-gawa River (scenic and uncrowded) or go straight up Karasuma-dori (where you’ll jostle with traffic and wait at lights).